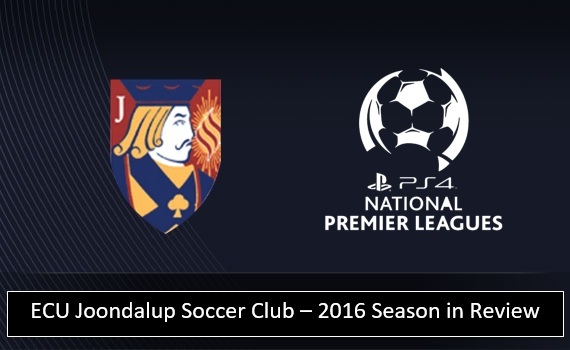 After a disappointing 10th place finish in 2015, ECU Joondalup bounced back in 2016 to make the West Australian Top Four Cup, and missed out on a Grand Final spot in a heartbreaking penalty shoot-out defeat against Inglewood United. We look back on the season and review the highs and lows of the season that was. The club invested significantly on and off the pitch in 2016, and after pin pointing deficiencies in the forward line the club signed Scottish striker Gordon Smith and the former Hearts striker rewarded their faith in him bagging 19 goals in the season, to be joint winner of the leagues Golden Boot. The club filled their second import spot by signed former Swansea City defender Joseph Jones, while they brought in former Perth Glory midfielder Steven McGarry as a player/assistant Coach and also added David Tough to their coaching roster. The squad was also strengthened with the addition of Perth Glory Youth midfielder Henry Durr, winger Josh Booysen, keeper Dave Keenan, defender Shane Pickering, winger Harley Orr and defender Steven Walmsley. Also the club brought in Physio Regan Arrigoni and High performance Coach Mark Scanlan to add to the professionalism off the park, and they were all set for a big season. The NPL Night Series started with a bang, with the Jacks thrashing Balcatta 5-2, but the pre-season tournament went downhill from there, and they failed to reach the Semi-Finals after losing their next four games. The season also started with defeat, a 2-0 loss at local rivals Sorrento, with new signing Smith missing the game due to suspension, a decision which left the club hierarchy and coaching staff fuming. Smith made his league debut in the first home game and the Jacks opened their account with a 2-0 win against Armadale, with the striker opening his account, before they thrashed Subiaco 5-2 at the ECU Football Stadium in Rd 3. The Rd 4 clash against Perth SC started well with Gordon Smith opening the scoring, but then injury struck with new keeper Dave Keenan injuring his knee, and he was to miss the rest of the season. Perth hit back to win 2-1. They then went on a horrendous run of defeats, and the performances were also disappointing. A 0-3 loss at Stirling Lions, a 1-4 defeat at Floreat Athena, before a humiliating 2-6 home loss against Balcatta. In the Balcatta defeat new keeper Lewis Italiano made his debut, the Wellington Phoenix keeper joining the club on loan for the rest of the season and it wasn’t a good day at the office for the shot stopper. The Jacks won their first game on the road in Rd 8 when they travelled to the Ashfield Reserve and came home with a 2-0 win against Perth Glory, with Steven McGarry scoring a stunning free kick to seal the points. They then lost the next two games, a narrow 0-1 loss to League Champions Bayswater City, before a 0-4 loss at Cockburn City, with Dale McCulloch having to field one of the youngest sides in the clubs short history. The Rd 11 game against Inglewood United brought the first half of the season to a close, and the visitors that day sat top of the table at kick off, but goals to Gordon Smith and Ollie Annis saw the Jacks run out 2-0 winners, and sitting in the stands that day was former Inglewood defender Rikki Smith, Jayden Drummond and Scottish midfielder Kevin Moon, who had signed in the transfer window. Next week we look at the superb run which took The Jacks to the brink of the league title……………….